Seagrass beds are vital habitat for Florida wildlife, and they may decline if poor water clarity obscures their sunlight. Resource managers in Charlotte Harbor have new tools to keep water clarity on target, thanks to a study by Mote Marine Laboratory and Janicki Environmental, Inc. The peer-reviewed study was funded by the Charlotte Harbor National Estuary Program (CHNEP) and published in the summer 2016 volume of Florida Scientist. The study provides new mathematical modeling tools that are helping CHNEP and partners produce a concise and easy-to-understand water clarity report card for resource managers, scientists and members of the public who aim to safeguard Charlotte Harbor’s jewel: more than 62,000 acres of seagrass habitat. 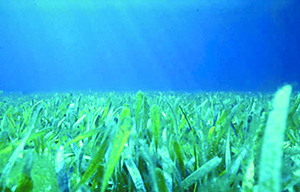 Seagrass beds shelter and feed small invertebrates, shellfish, fish, manatees and more. Resource managers track the health of Charlotte Harbor’s 14 estuary segments, in part by monitoring changes in water quality and clarity. Clarity describes how much light reaches a given depth without being absorbed, scattered or otherwise made unavailable to seagrasses. Clarity is critical but tricky to monitor in shallow estuary waters, where the changing angular distribution of light can challenge even high-quality measuring gear. To address this challenge, the new study presents an optical model, which translates water quality sampling results — water color, turbidity (cloudiness from particles), and chlorophyll from algae — into water clarity values, describing how much light will be blocked from seagrasses at a given depth. Using water quality data from water samples, the model can estimate clarity more consistently than available instruments can measure it in the field. The new study also provides the water clarity reporting tool produced by Janicki Environmental, Inc., which compares present water clarity with a past reference period, detecting improvements and declines. To create the new optical model, Dixon analyzed years of water quality sampling and light-sensor data from Charlotte Harbor, using only the most reliable data. Using the finished model, Charlotte Harbor-based scientists can plug in their own water quality data — color, turbidity and chlorophyll — to calculate water clarity with more accuracy and precision than ever before. Dixon’s model is also the first to represent how Charlotte Harbor’s water quality affects the individual wavelengths within sunlight, such as blue, green and red. That’s important: seagrasses need specific wavelengths of light. To see how water clarity fares from year to year, the public can visit the water clarity report card on the Charlotte Harbor Water Atlas website presented by CHNEP and the University of South Florida. For example, the Report Card shows that Pine Island Sound had stable and often good water clarity over the past decade, whereas another area called West Wall had declining clarity for the past four years and cautionary scores before that. Scores for most sites vary among years or every few years. Researchers monitor these annual changes for longer-term trends. Water quality data, used to model clarity, are collected each month by the Coastal Charlotte Harbor Monitoring Network. Partners including CHNEP, the Florida Fish and Wildlife Conservation Commission, City of Cape Coral and Florida Department of Environmental Protection. Lee and Charlotte counties collect and analyze about 65 randomized samples each month across Charlotte Harbor, from Lemon Bay through Estero Bay. Field scientists continue to monitor light in the water with increasingly sophisticated gear, which in turn helps to check and refine models such as Dixon’s.